“A great performer feels this sharing,” This line, written by the choreographer and theater visionary, Alwin Nikolais, describes the ideal relationship between dancer and audience. Nikolais recorded this thought on a sheet of paper containing other observations and, wonderfully, this handwritten series of notes is one of the many extraordinary objects to be found in the current exhibition, “Alwin Nikolais’ Total Theater of Motion,” on display in the New York Public Library for the Performing Arts’ Vincent Astor Gallery. The exhibition, curated by Claudia Gitelman, runs until January 15, 2011. I have been a fan of Nikolais since seeing an utterly astounding performance of Noumenon in the late 1970s. Although I was not well schooled in dance history and in spite of my regrettable lack of exposure to dance at that stage, I recall feeling that I was witnessing something very special and was certainly inspired. The experience of Noumenon (along with an explosive solo piece by Murray Louis) made me want to dance. Moreso, it made me feel as though I could dance. Sharing, indeed. It was, therefore, quite thrilling to encounter so much material in the NYPL exhibit that explores Nikolais’ educational endeavors, particularly his years with the Henry Street Settlement House on New York City’s Lower East Side. Nikolais, along with Hanya Holm, directed the dance program there for many years and the exhibition celebrates this period with delightful photographs, programs, and posters. Under the directorship of Nikolais and Holm, the profile of dance in the community was raised to fabulously high levels and great numbers of young people were engaged and turned on. There is a particularly memorable photograph in the exhibition (from either the 1940s or 1950s) that shows a huge line of neighborhood people outside the Henry Street Playhouse, waiting to gain entry to a dance performance. At another point in the Henry Street Settlement House section, a caption reads: “The first performing experiences of professional students at the Henry Street Playhouse were in dance dramas for neighborhood children. Nikolais invented whimsical plots, vivid characters and outlandish costumes.” Nikolais was bringing dance to the people in a major way. Some date omissions are problematic. However, the selected materials, the overall arrangement of the show, and the generally informative captions all get high marks. 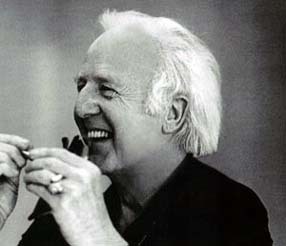 The highest mark, though, goes to the simple act of creating an extensive tribute to the life and work of Alwin Nikolais. It is a well-earned but long overdue tribute and I can say with great sincerity that it is a tribute very much appreciated. And well worth seeing before it is taken down on January 15. 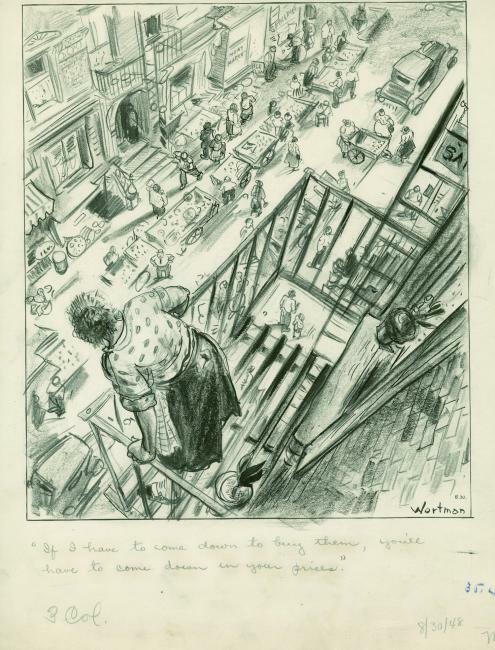 And, speaking of long overdue tributes, I just want to take another moment to praise the Museum of the City of New York (MCNY) for the current gem of an exhibition celebrating the work of Denys Wortman, cartoonist for the World Telegram and Sun from 1930-1953. I knew nothing at all of Wortman’s work prior to seeing the exhibition and now cannot fathom his absence from notoriety for all of the years following his death in 1958. What a wonderful observer of society and socioeconomic classes, and how important to bring such marvelous and significant work to the attention of the public once again. The exhibition, entitled “Denys Wortman Rediscovered,” will be on display at MCNY until March 20, 2011.